We have more vintage cards than anyone online. Dean's Cards was founded in 2001 by Dean Hanley, a fellow card collector, and has become the leading online seller of sports cards and magazines. DeansCards.com buys hundreds of sports card collections each year and has over one million cards online. Our 5,000 sq foot office is located in Cincinnati, Ohio and we have ten full-time employees. 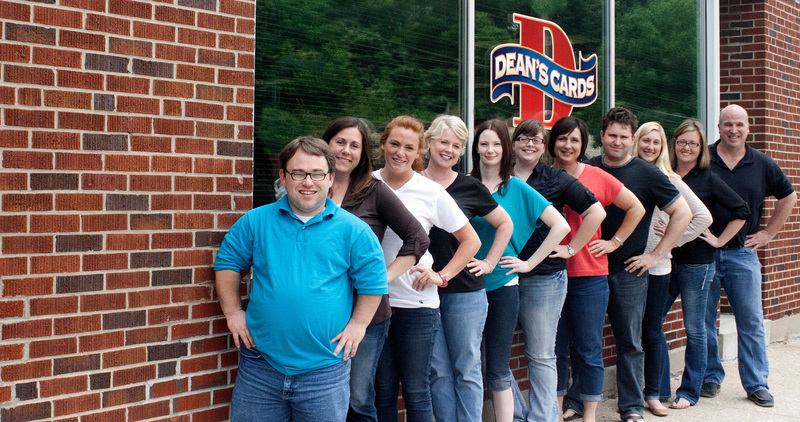 Our goal at Dean's Cards is to provide our customers with a simple, cost-effective and enjoyable way to build their collections. We have the largest online selection of baseball, football, basketball, hockey, and non-sports cards ranging in years from 1887 to the present. We also offer thousands of issues of Sports Illustrated, Sport Magazine, Baseball and Football Digest as well as vintage team yearbooks and media guides. We are told by customers, that our Customer Service is the best in the hobby. Most orders ship within one business day and we are the only store in the hobby (that we are aware of) to be validated as a Google Trusted Store. We are NOT a physical retail store that people can visit, so we were able to focus our efforts on designing and stocking a website that provides the best collecting experience possible. The mission of Dean's Cards is to make collecting vintage sports cards Fast, Easy and Fun! We fulfill this mission by constantly striving to maintain the best E-commerce Shopping Experience, Product Selection, and Customer Service in the hobby. Specifically, we do this by: 1) designing the DeansCards.com eStore to be fast, secure and easy-to-use, 2) by having online inventory of both the individual card, and the complete set, for every vintage (1948 to 1979) baseball and football card set, in at least three different card conditions, and finally 3) a knowledgeable, friendly team and a 100% guarantee of all purchases. If you will give us the opportunity to earn your business, you will be glad that you did. We guarantee it. We love this hobby and work very hard to ensure that orders are shipped 100% correct, mailed within one business day and that the items sent are conservatively graded. If you are not happy for any reason, you may return your order for a full refund. Dean (right) pictured with Lance McAlister (left). Dean Hanley was interviewed by Lance McAlister on "The Nation's Station" 700 WLW Sports Talk on Thursday, April 12. Dean discussed the past, present and future of the baseball card collecting hobby and Dean's Cards sponsorship of the Cincinnati Reds Hall of Fame. Dean also answered questions from callers for the hour he was on the air. Click here to listen to the show or download the podcast. Click here to see a video about the program. 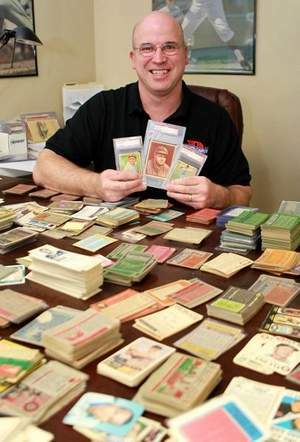 One of the foremost experts on the subject of vintage baseball and football cards, Dean created Dean's Cards with collectors in mind: "I am a collector, just like our customers. My goal is to provide the ideal place to buy sports cards. We strive to make the experience fast, easy and fun. The whole Dean's Cards team has worked hard to provide the best selection of vintage cards available anywhere, toughly graded and at great prices." Aside from running his website, Dean strives to educate the card collecting hobby by writing a blog, filming videos, writing articles for Sports Collectors Digest, and has published two best-selling books on vintage baseball cards. From Left to Right: Zach, Christy, Raychel, Valarie, Emily, Jennifer, Colleen, Brian, Elana, Tara and Dean. To View our Buyer and Seller Testimonials, please click here.